Going down Las Ramblas, just next to the Liceu Opera House to your right, you will see the entrance to the most reknown market in the city La Boqueria. The place is always full of tourists and locals. Customers fight their way through the crowds of photographers-to-be, camera in hand, competing for the best picture of the remarkable exhibition of exotic or traditional fruit like these healthy red strawberries. The best stalls are right at the main gate though. Try going to the other side then and visit the little squares a couple of blocks away where there are nice restaurants or bars to sit outside in the sun. If you are a graffiti lover you will have a perfect day too. To know more check the history of La Boqueria market. hmm,yummy.those are big strawberries compared to our local ones. Carlos, i've been there a couple of months ago and remember it exactly like you described. Thanks for the memory! These strawberries are just perfect! >Lisi: yes,they are. We are used to strawberries but these were really big and the presentation exquisite. >Don´t you worry midnitebara these ain´t normal. I felt like sticking my head in the whole bunch. >dutchie, I am glad to have witnesses. I you don´t see it you would not believe it. Thanks. >Marjorie: Yes I reckon the price for some of you may look cheaper. Sure the quality is the same. 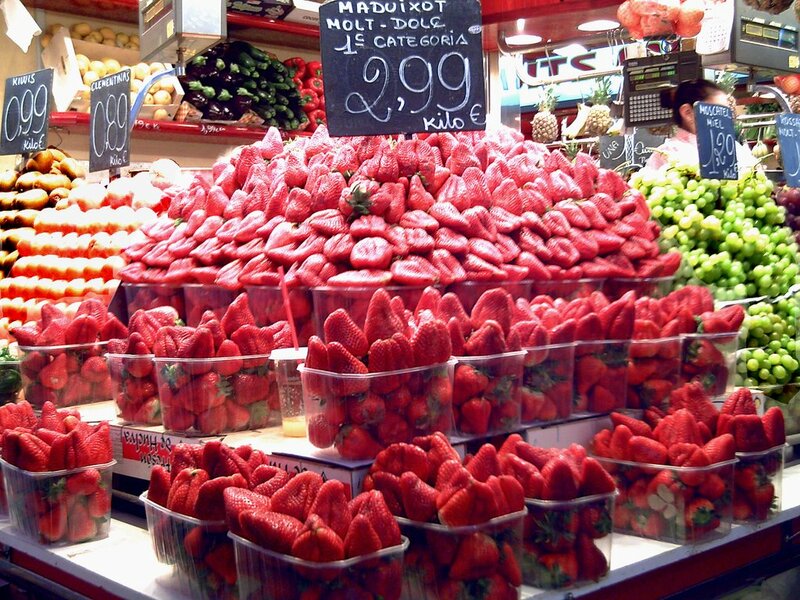 Our best strawberries come from Huelva, Andalucia (a town called Lepe). >Hello Sam, of course scrumptious and ambrosial. Feel the smell? ay qué rico!! great shot!! Great price. Cheaper than in California. Hey - I just had fresh strawberries from Spain last week. Got them in our supermarket and they were very good!! Oh, I would kill for some right now! These and some Cava and I can sit doing doing nothing the whole day. You tempt us so well. >Luggi: Yes I guess so. We still have some good prices. >Nicola: That's a good. We export a lot of good fruit. Yet, we don´t go to this market to buy often, it´s still cheaper some other places, but not with that superb quality. >Edwin: Temptation, humm. Yes I guess red is quite provoking and triggers a lot appetite, hahaha. Cava would be the right additive to make it more idilic.